How did I get so far behind with the blog so fast? We need to go back a week to when we were still in Moab, Utah. The day after we went to Arches National Park we went to Canyonlands National Park. Canyonlands is huge!! I didn’t think anything could make the Grand Canyon look small, but Canyonlands does. The Park is so large that it divided into 3 parts: Island in the Sky, the Maze and the Needles. The part closest to Moab is the Island in Sky section, it is 35 miles from Moab. It is primarily made up of a huge mesa that is divided by the Colorado River on one side and the Green River on the other. The isthmus that keeps the Sky Island attached is only a little over two lanes wide and I am sure that the park service will need to install a bridge in the future. The Sky Island is from several hundred to 1000 feet above the surrounding area. If you look close at the slide show you can see a jeep road going across the lower mesa. The jeep road is a 100 miles long just circling the Sky Island and is very popular with jeeps and mountain bikers. At the end of the road at the Sky Island district is Grand View Point. You can see at least 35 miles in every direction and pretty much everything you see is still part of Canyonlands National Park. Access to the Needles district is a dirt road about 75 miles south of Moab and access to the Maze district is from the town of Green River. 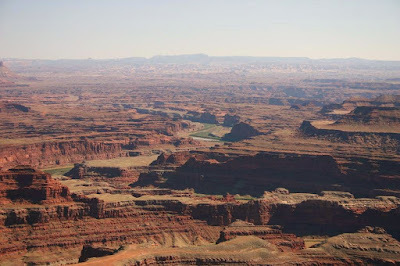 We didn’t go to either of these areas and will have to come back to see more of Canyonlands National Park. 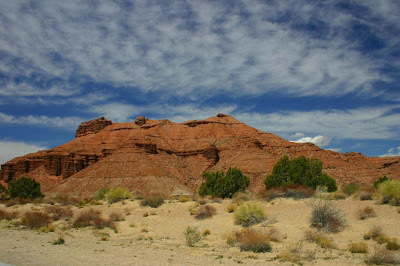 Another thing to see in the Moab area is the LaSal Mountain Loop. This is a 65 mile drive mostly on very narrow curvy road. 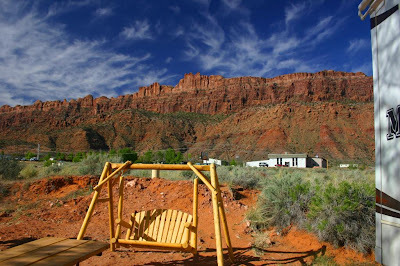 LaSal Mountain is the snow capped peak that you see in many of the pictures taken from Moab. It is 12,000 feet high and the loop road goes up to 8,000 or 9,000 feet. 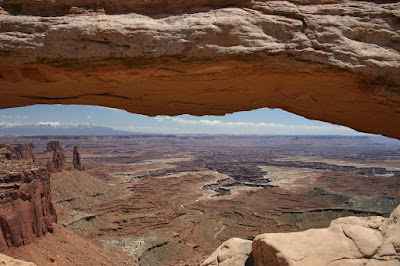 On a clear day you can see deep into Canyonlands from the loop road. Unfortunately, the day we did the loop there were clouds coming into the area so the distance view was somewhat obscured. The end of the loop drops into Castle Valley and then follows the Colorado River back into Moab. If you are in the area you should do the LaSal Mountain Loop counterclockwise, because you will be on the inside on the very narrow areas with big drops and you get a great view as you descend into Castle Valley. In a big Chevy dually it was thrilling! We stopped for a picnic along the Colorado River and watched the rafts float by, it was very relaxing. Bird Note: We saw a pair of Virginia's Warbler while having our picnic along the Colorado River. It was a life bird for both of us. Our week in Moab had come to an end and it was time to start heading north, after all we are trying to get to Alaska this year. We have never been to this part of Utah before and we took I – 70 to I – 15. This route had spectacular scenery unfortunately; you can only take so many pictures while driving down the Interstate. Very nice blog. I found it while on the road in Utah looking for info on the Lasal Mountain Loop, you had a really good description. I also enjoyed your tid bits on the microbrews, I also like to sample local brews.